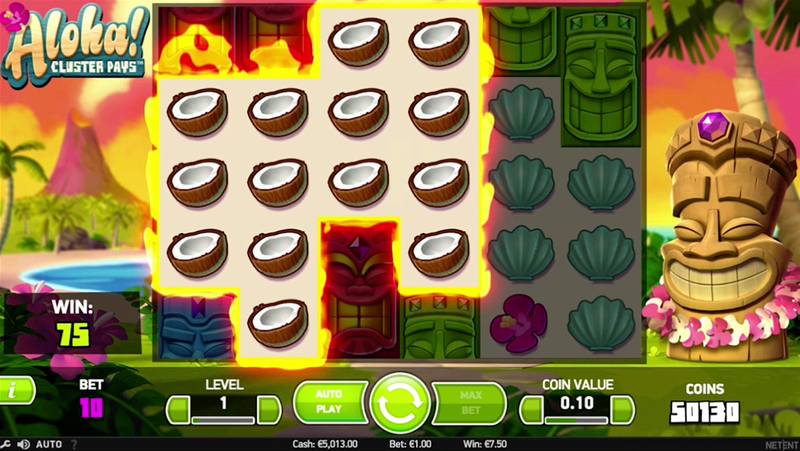 Enjoy the tropical surf of Hawaii in this island adventure 5-reel and feel the sun on your back when you win some free spins and multiplier slot bonuses on the beaches of Pearl City with these amazing slots online games. An almost unparalleled level of experience and expertise goes into every NetEnt online slot. That's why we love them here at slot games online casino. With two decades of research, artistry, mechanics and mathematics behind them, you know when NetEnt release a new title to the market, that it will be packed with innovation, engaging gameplay, and the highest level of entertainment in the industry. Sit back, relax, and prepare for a welcoming, equatorial breeze, while gentle waves lap over your toes, and super-sweet cocktails in coconut husks line up beside you. And, also, get ready for some cool, creative wins. 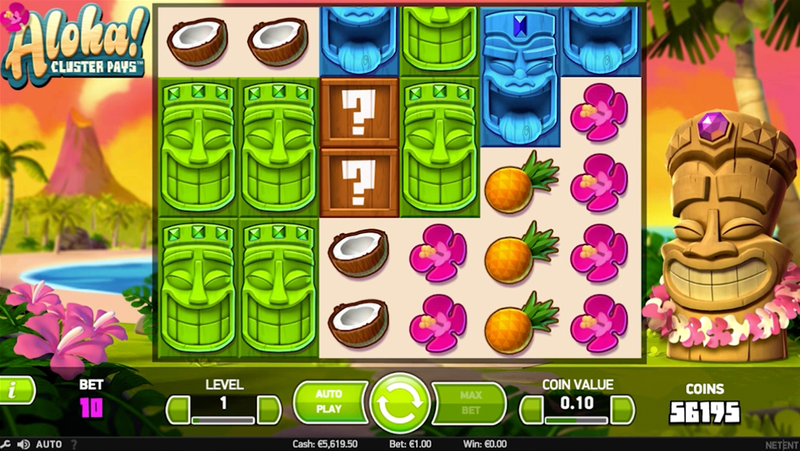 NetEnt’s Hawaiian-themed online slot game, Aloha!, comes with cluster-wins and plenty of charm. This 6 reel, 5 line slot comes with no basic payline structure – the wins are collected by landing clusters of 9 symbols. This may initially sound a like a high number, but when the clusters are collected both vertically, and horizontally, and in any shape – the wins are never far away. To make for some more variation, NetEnt has thrown in some double-symbol totem heads, in Red, Green, and Blue, alongside the Pineapple, Coconut Husk, Sea-Shell, and Hawaiian Pink Hibiscus. The highest value symbol is the Red Totum, which will pay out a 10,000 coin reward for a full screen! And with this prize on offer from just £0.10 per spin (up to a maximum of £200.00), we are certainly looking at some big rewards, based on our stake. 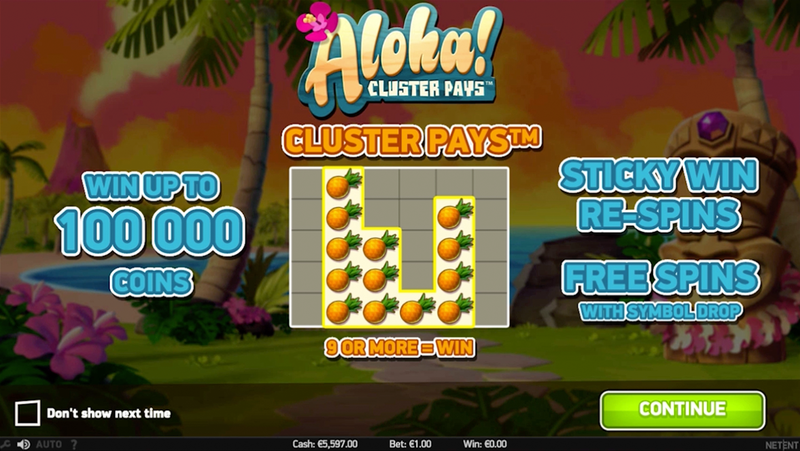 There are two Free Spins features within the game; the randomly triggered Sticky Win Re-Spins feature, with all winning symbols staying in place, and even collecting allies, while the Free Spins play out, and the regular Free Spins Feature. This is activated by landing 3 or more of the Free Spins symbols, which will reward us with 9 Free Spins. The Symbol Drop mechanic is activated during this Bonus Feature, where lower win symbols are dropped, to increase the chance of a bigger win. Single cell Totum symbols also appear in this feature. Learn how to pay by mobile! Along with its innovative gameplay, the graphics and audio of Aloha! Are among the best on the market. The SFX, from the peaceful twitter of local birds and sweeping waves to the wooden patter of the reels spinning, all combine to create a genuinely original atmosphere for online gaming. Along with some clever features in the Free Spins and Sticky Win Re-Spins, NetEnt has created a fantastic game that would suit any taste. NetEnt has always been big on innovation, and with Aloha! they have delivered a creative cluster spin game, with all the charm and character of any NetEnt slot on the market. What’s so great about this game is that the way they have gone about creating the atmosphere is so effective - the game is genuinely relaxing to play. Certainly still full of fun though, at Easy Slots, we reckon the best way to find out is to play it for yourself. 10/10. If you enjoyed Aloha! you might also like Mad Mad Monkey Slots online slot game or if you want more games, Click here.